Famous discobar made ? ?from a deconsecrated church. The evening begins with a buffet and very often a live music performance, and then continues with music mixed live. The intermediate floor has a second bar for the busier evenings. The main room is dominated by a huge chandelier, which can be raised or lowered depending on the moment. 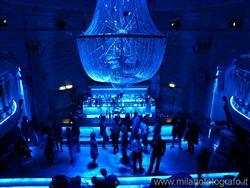 The lighting system is very rich and can offer an endless number of atmospheres and changing colors. The public is always elegant and generally aged 30 and over.